Given a m * n matrix, if an element is 0, set its entire row and column to 0. 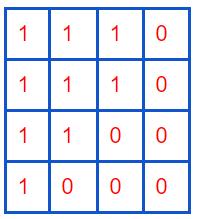 This problem should be solved in place, i.e., no other array should be used. We can use the first column and the first row to track if a row/column should be set to 0. Since we used the first row and first column to mark the zero row/column, the original values are changed. Step 2: use first row and column to mark zero row and column. 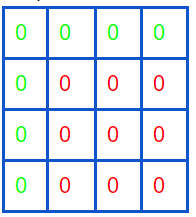 Step 3: set each elements by using marks in first row and column. Step 4: Set first column and row by using marks in step 1. When does it get overwritten? I think you are not considering the case, that the first row or first column is not 0 and therefore should contain the values at the end that it contained at the beginning. 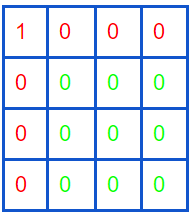 In your solution the current values of row and column 0 would be overwritten. readable, clean, efficient code. O(1) in space which is cool. 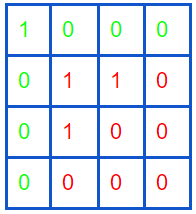 Your solution takes O(n*m(n+m)) if the matrix is full of zeros, which is O(n^3) if n==m. Wang’s solution is wiser and takes O(n*m).